12/09/2016 - notes from Carter Richardson, new owner and owner of East Passage Boatwrights in Bristol, RI: work on her includ[ed] a couple of new underwater planks, sheer strake repair, some new frames, new deck canvas (sunbrella), new sole and coamings and some spar repairs. 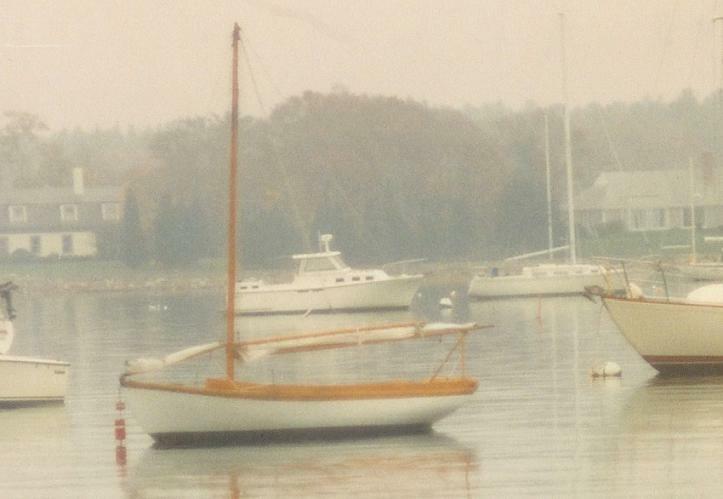 7/23/2004: Owned by Bill Beardsley of Marion, MA., who also has a Herreshoff 15, totally restored by MP&G. Bill has owned Shadow since 1971, and always will. Her original name was "Betty" (after the daughter of the original owner, Butler, who Bill knew). She does not have the hull plate. She was delivered in May of 1930 to Barden's Boat Yard in Marion, which acted (and still occasionally does) as an agent for the boats. That summer, she appeared in the Beverly Yacht Club register as belonging to a summer resident of Marion named Butler, brother-in-law to the Converses of Marion. Because the HMC records show her going to Barden's, we are not 100% sure the Butlers were the first owners, but it stands to reason. The Converse family had her thru the war and she eventually went to another family in Marion named Robinson. Bill bought her from another Marion family, the DeWalts. They said they bought her from someone in R.I., so that piece is missing. She's in good condition, although not perfect. She's had all new frames & floor timbers, a few new planks or pieces of planks, a new aft deck and transom, the latter twice. She's perfectly sound, although her hull isn't as fair as desired, considering the new frames and fastenings. She has been to many events at the Herreshoff Museum. Katy-Did, hull #1159, was one of Bill’s grandfather's (Herbert Newbury) two boats, named after his aunt Katherine. Delivered 5/9/1930.